Just only a week after Brad Renfro died from presumably an overdose, we have another actor fallen victim to drugs. It was pretty shocking news, because I was so looking forward to his take on the Joker in the upcoming Batman movie, The Dark Knight. Admittedly, I was also skeptical about his casting at the beginning. I first noticed Ledger on the teen flick 10 Things I Hate About You, which was a teen version of The Taming of the Shrew, with Ledger playing the role of the tamer and Julia Stiles the shrew. He seemed quite fitted for these types of teen hunk role. 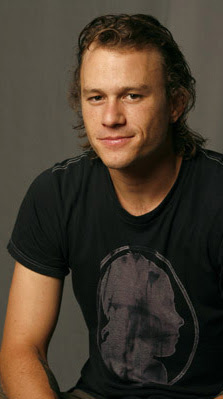 But subsequent career choices (Monster's Ball, Ned Kelly, Candy) indicated that Ledger was trying to avoid typecasting. His greatest success finally came when he took the role of Ennis Del Mar in Ang Lee's highly acclaimed gay romance Brokeback Mountain. Recently, Ledger was in another critically lauded movie, playing one of several interpretations of Bob Dylan (along with Cate Blanchette, Richard Gere, and Batman co-star Christian Bale) in Todd Hayne's I'm Not There. He was easily one of the few rising young actors whose works were worth taking note of, but sadly we'll no longer be able to see what other exciting contributions to cinema this man was going to make.